We have another example of the power of the Internet in fighting crime. After Ahryun Moon, 29, had her laptop stolen in Joy’s Place, a San Francisco coffee shop, the security video was placed on YouTube. Sure enough, someone spotted the women in the video still wearing the same distinct outfit. 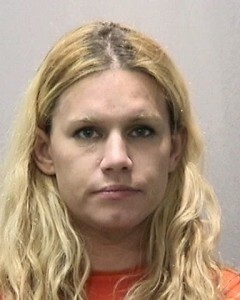 She is Pawl Raynal, 32, and fittingly enough was arrested in another Bay Area coffee shop. The video had 200,000 hits before Raynal was spotted. As shown below, Raynal lifted the laptop when Moon went to the bathroom. As you might imagine from Raynal’s cool demeanor in committing this crime, this is not her first brush with the law. There was an outstanding warrant out for her arrest. She was booked on suspicion of burglary, possession of stolen property, false impersonation and a parole violation. Inu, I would say crystal meth. She was then charged with another theft from March 5th of a Flatscreen TV she had stolen from an apartment building. All to feed her drug addiction, as made clear by the mug shot. No kleptomania here, this woman is just a thief. And, we often read about the dark side of surveillance. But, there is a big up side to it. Good thieves are ALWAYS aware of cameras. This woman needs to step up her game or stop stealing. Cleptomania is not becoming of her.